We designed this vest to honor our American disabled service veterans. It is so beautiful and colorful that we have been asked to add it to our product line. 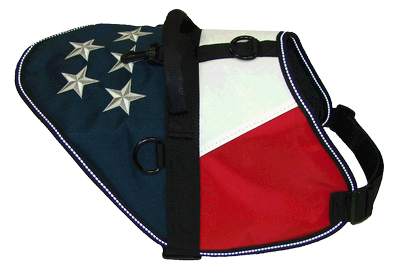 It is made from the same high quality materials that we use in all our working dog vests. It has been designed in a red, white, and blue color scheme like our American flag colors. The top back portion of the vest has five embroidered stars on it. This vest has a standing tubular handle, swivel snap for an ID and both the chest and girth straps are adjustable. The vest is lined and bound in reflective webbing for an added safety feature. There are three black metal D-rings on the vest, one to attach your leash and there are an additional two D-rings if you use a pulling lead or a bridge handle with your working dog. Patches stand out highly visible against the red or white areas of this vest. The vest comes with two free patches of your choice.